Hello, hello, hello! I decided to take a blog break and enjoy the summer! But I'm ready to get back to posting. I'll be around to visit everyone soon. In the meantime, to create today's card, I used the duck from the Make it Crafty Hiding Deer and Duck digi set. Somewhere in my travels across blogland, someone made a card very similar, I apologize for not making note of the blog or their name. It's nice to see you back Tammy. Your card is gorgeous, I love the image and stunning colouring. Welcome back!! Hope you had a nice break. Super card, Tammy! I am so glad that you had an opportunity to enjoy what was left of summer, 2015, Tammy! Fabulous frame for this daffy duck!! Love it! Welcome back. You had me worried there for a while, but I saw you on Facebook, so I was comforted by that at least. Great card! Welcome back there Tammy!! :) Wondered where you went!! LOL!! Your card is amazing!! 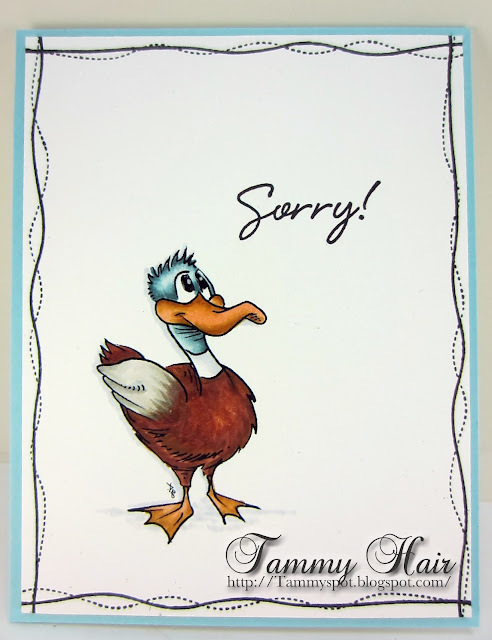 I love how you've colored this adorable duck and the squiggle lines around the borders add so much to this!! Welcome back Tammy, glad you had a good summer. Love your amazingly cute little card! The last few days I've been thinking about shooting you an email, so it's great to see you again and know you were just enjoying your summer. This is cute! I had to go look, of course. Love the way the duck seems to be looking at the sentiment. You are so good with the coloring. Please tell me you have a stamp to make all the dot doodling!!! Otherwise, you have a lot more patience than me. It's perfect though and I LOVE that duck! Gorgeous coloring and a truly perfect card Tammy. So glad you're back too. Fabulous card, love that duck and great borders. Welcome back! Your card is wonderful. :) Big hugs to you Tammy!! Great looking carfd Tammy! Love the coloring and the doodles.